Rabbit Creek Country: Three Ranching Lives in the Heart of the Mountain West (University of New Mexico Press, 2008) is a work of non-fiction, focusing on three early twentieth-century settlers (a cattleman, his wife, and a schoolteacher) who ranched together in the Livermore foothills, thirty miles northwest of Fort Collins, Colorado. The book ties their lives into the environmental history of the district, and into changing patterns of land use up to the present day. The book is available at many bookstores and from University of New Mexico Press (1-800-249-7737 or custserv@upress.unm.edu). I walked into the lives of John Elliott, Ida Elliott, and Josephine Lamb. The chance discovery of a deserted house on Rabbit Creek, in the northern Colorado foothills, turned me into a biographer. I have spent the better part of a decade researching and composing the story of the last occupants of that house. When I think back on the origin of this project, I can only wonder at the role geographical accident plays in altering our destinies and destinations. As a boy, I liked to walk the countryside, but mountains were a land form I did not know, for I grew up on a flat sandy peninsula bounded by the Chesapeake Bay and the dark grey Atlantic. There were no hills in rural southern Delaware, and the only mountains were the waves of the ocean seen through the eyes of a child. Then, on a Boy Scout trip in Virginia, I climbed Massanutten Mountain, a hill by western standards, but for me a turning point in my experience of the world. I moved to northern Colorado in 1979, taking a position as professor of English at the State University in Fort Collins. Ever since, I have roamed the hills and mountains of the Front Range. Where I most like to go is the Livermore country, a land of pastoral valleys—Rabbit Creek is one of them—and granite monoliths. Two emotions are at the heart of my book: dismay at the progress of rural sprawl in this region, and curiosity about the early twentieth-century settlers who ranched these grasslands. Their way of life, like all ways of life, was flawed, and the myths and cliches about the Old West that arose out of it have left a misleading picture of the past, with all the usual consequences. Yet these ranchers also developed an extraordinary intimacy and affinity with the mountain lands they occupied, and they saw themselves as good stewards of the environment. I wrote this biography to understand the interwoven lives of the Elliotts and Miss Josephine Lamb—and to convey a particular vision of the land-bound culture they represented, a culture that flourished in the first half of the twentieth century. Their story, fascinating in its own right, offered a window into the inner life of times which, though different from ours, are nonetheless a prologue to the profound changes we have seen in the foothills during the last two decades. John and Ida Elliott and Miss Josephine Lamb lived together for forty-two years. This fact provoked intense discussion in the community, and dissension within the family. As a result, their lives became more accessible to me than they would otherwise have been. Yet I never met the ranchers about whom I write. The last of them passed away six years before I came to Colorado. I myself am neither a rancher, nor a resident of Livermore. This might have posed an obstacle to gaining the trust of the people I talked to. From the beginning of the project, however, I had the good fortune of working with Deborah Dimon. She agreed to be my research associate, and is now a colleague in the Department of English. Deborah had lived in the Poudre Canyon and worked there as a Natural and Cultural Resources Interpreter for the United States Forest Service. Not only was she familiar with the local scene, she had personal connections to many Livermore people. Her presence opened doors. Together we were able to discover the remarkable story of the three settlers. After that first walk up Middle Rabbit Creek, an urge took hold of me to unwrap the mystery of the place, to lay bare the destinies of the unknown ranchers who had lived there. It was as if those three individuals were asking me to disinter them from obscurity and bring them back to life—no matter what the risks. I have taken up their invitation. When Ida Meyer was twenty-four, she shot a bobcat. One of the earliest photos of her in the West records that event, which took place in Livermore, in 1898. Whoever snapped the picture probably used Ida’s Eastman Kodak camera. It seems she took it with her everywhere, and she was as good at shooting pictures as bobcats. Miss Meyer came to Livermore in 1897—two years after the Elliotts had moved to Westlake. This chapter surveys her early life up to age thirty-four, and looks closely at her work as an amateur photographer. “Early life” is a relative term. The average life expectancy of white men and women born in 1874 was forty-three years. At thirty-four Ida would have been considered middle-aged, if not old. Yet she lived to be ninety-three. Given her longevity, the first thirty-four years were indeed her early life, a part of her life that presented a striking contrast to the sixty years that followed. In the bobcat photo Ida Meyer stands next to Elmer Keach, the son of early settlers in the Rabbit Creek district of Livermore. He was not married at the time of the photo. His early biography illustrates the fragility of life in the second half of the nineteenth century. Keach’s mother died when he was six. In 1896, his first wife died in childbirth. She was in her twenties and they had been married less than a year. In 1901, Keach remarried, but his second wife also died in childbirth (though the baby girl named after her survived). To become pregnant was to court death. Ida holds the rifle with ease. We know she carried a pistol. She and Elmer stand on a verandah. He is holding the bobcat: it would have been unlady-like for Ida to do so. She wears a well-tailored dress, the waist tightly drawn in by a corset, perhaps stiffened by whalebone. There is something wry in her half-smile. With slightly raised brows she seems to be telling us: I have bagged this bobcat. I am pleased to be such a woman, and glad you are looking at me in my fine hunting costume. The Elliotts’ toddler had become a boy. Ida photographed him in various poses, in his cowboy hat, sitting on a pony, working the hay stacker. In one shot, he looks like little Lord Fauntleroy. He is dressed in a suit with knee breeches, worsted jacket, and matching cap, but, incongruously, he stands next to the ranch house, framed by a wild growth of cottonwoods. The outfit is a gauge of Ida’s hope that the ranch boy might someday feel at home in the larger world. The way to bring the world to a mountain ranch child was through schooling. Such a child usually attended school from age six to fourteen. After the “eighth-grade graduation,” they either went into town for high school, they went out to work or to learn a trade, or, more rarely went to Fort Collins for high school. When Buck was six, in the fall of 1917, the Superintendent of Larimer County schools sent a teacher up to the Elliott ranch. Miss Ruth Richardson taught Buck at home in the first year, and in the second year at a tiny one-room schoolhouse on the North Rabbit with one other pupil, Madeleine Sloan, who was six years ahead of him. Miss Richardson’s photograph has been pasted in Buck’s scrapbook for ninety years. This young woman, however, stayed only two years. Due to low pay and social isolation, a rapid turnover of teachers in the mountain schools was the norm. The children were left in the lurch. So the Elliotts needed a new teacher. Ruth Richardson’s successor was Miss Josephine Lamb—a young woman who grew up in the hills west of Fort Collins. Miss Lamb was qualified: she had two years teaching experience, was a high school graduate, and had taken college classes at Greeley. In an interview at the Livermore Hotel, thirty-seven years later, she told, in her own words, how she first came to Livermore: “our County Superintendent needed a teacher up here. . . . and so she sent me . . . I didn’t know anyone. All I knew about the country was what my father had told me . . . he was an early prospector in Manhattan. And I did know a good bit about the topography of the country, but the people I did not know. And when she sent me here, it was right in this room I came first. I came up on the stage and the Elliotts met me and I went to the ranch and taught there.” For Miss Lamb the Livermore Hotel and its surroundings were new sights, but for the couple from Rabbit Creek it was home territory. Ida had worked in the hotel and John regularly stopped there as a freighter. Would Miss Lamb be able to endure the hardships of mountain life? Would she see Buck through his eighth-grade graduation? At their first meeting, John is reported to have said to her, “I guess you’ll leave too.” Miss Lamb replied, “Mr. Elliott, I have come to stay” (BT). 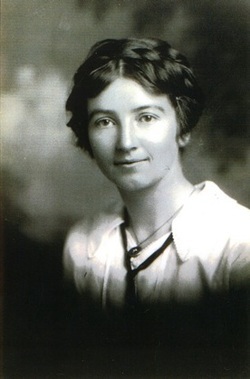 She taught the winter term of 1919, at the schoolhouse on the North Rabbit. Buck was eight and she was twenty-one. The year after her arrival the Sloan girl finished, so John Elliott built a schoolhouse on the ranch. It had a bedroom for the teacher. I think she did. In any case, the “slip” is revealing. Jo Lamb did not hesitate to assume for herself the rights and freedom of action of a man. There was a good deal of boyishness in her, which came in handy when she taught. Margaret Ann McLean visited Rabbit Creek ranch as a girl. That was in the 1930s. Later in life, she shared with me her memory of a little incident concerning the owner. “ John Elliott had a doll, in levis, shirt, and bandana—a cowboy—and he had it in his room. I was in his room and spotted that doll on his dresser and I fell in love with it . . . .” Margaret explained that on visits several years, she admired the doll so much that Elliott broke down and gave it to her. That a big rugged man like John Elliott kept a cowboy doll on top of his dresser tells us something about the second part of his life, which is the subject of this chapter. In youth and early manhood, John had been a cowboy himself—for seventeen years. 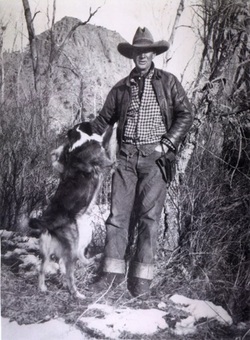 Yet now he called himself a “cow man,” the term he liked to use instead of “rancher” or “landowner” (DL). The word choice is significant. A cowboy was a hired hand and no matter how old, still “a boy,” for he did not own land and cattle. The cowboy was wild and impetuous like an adolescent, especially if he was single. He did not knuckle under to the responsibilities and moral codes of the adult world. A “cow man,” on the other hand, was a cowboy who had grown up and come into his own. John’s usage suggests not only difference, but also continuity between the two stations. And that may explain why this “cow man” kept a doll on his dresser. It was not so much a toy as a household idol that represented his past. It stood for a particular character ideal. John was a cow man, but he never entirely let go of the cowboy. In the year before he died, Elliott came back to live in Fort Collins. Seriously ill, he stayed at the house of Jo’s sister Del who was a nurse. There, he liked to watch the cowboy shows on the family’s TV, something he could not do in Livermore. It was 1961, the golden age of the westerns—of Gunsmoke, Wagon Train, and Bonanza—and he found them absorbing. All that said, Elliott did not fully subscribe to the myth of the cowboy. Perhaps because he had been one himself. In reply to a question about whether he had carried pistols, he said, “We didn’t carry guns. No, if you’d carry guns, there’d be some young stupid kid to see if you could use ‘em” (BK). John Elliott was a crack shot. At Rabbit Creek, he shot ducks on the wing, with a rifle, not a shotgun. He owned a matched set of Colt .45 revolvers with pearl handles (JiE). On the trail, though, he carried a bull whip rather than pistols. Livermore was cattle country but not Dodge City; it was by and large peaceful. There had been several Indian raids in the 1860s. There had been rustling, a few stagecoach robberies, and some fence-cutting. But there were no shootouts, vigilantes, or hanging trees. There were no saloons or brothels. John was a hard-working stockraiser. Unlike screen cowboys, he was not a drifter, not a Texas Ranger. He didn’t sing or play the guitar. He wasn’t bashful around women, and his manners were not gentlemanly. He smoked and drank whisky. In short, he was no Gene Autry. Nor was he an Alan Ladd, or even a John Wayne, to whom, because of his size and presence, he might most easily have been compared. Many people we talked to, however, thought of Elliott as the exemplary cowboy, not the TV version, but the early Livermore type, born to the saddle, reclusive, and cavalier in his ways. John Elliott was a large man, and at six foot three inches, maybe the largest rancher in those parts. He was clean-shaven and handsome. His demeanor resembled people’s idea of the cowboy. An air of backwoods grandeur hung about him. As a cow man, he retained the rough ways of the cowboy. The fine manners of his upper-class English employers did not rub off. He never tried to be genteel. This set him apart from other Livermore ranchers, and it was one reason the community found it hard to embrace him. Elliott seemed to stand outside the social norms of Livermore. Local people explained, or in some cases justified, his conduct by invoking his irrevocable cowboy nature. Elliott himself had a flair for playing the role. A good example is the picture he had taken of himself on Rabbit Creek in 1928, when he was fifty. At the time he was in good health and a prosperous cattle man. And he looks the part. This photo became a kind of icon, reproduced more than any other image of John Elliott. Behind him rises the most impressive mountain in the Rabbit Creek drainage. So often was he photographed with this peak in the background that his grandson Phil Elliott called it his symbol. Elliott wears the clothes of a stockman of the day: an enormous hat shadowing his eyes, a leather jacket, then a shirt, beneath that, a sweater, and a pair of jeans with large cuffs (they were his ashtray). A cattle dog stands on its hind legs, reaching for its master’s arm. It is a potent image. John wears what looks like a gun holster, but it is actually the leather case for the camera, not a pistol. The camera was Ida’s Kodak. Josephine took the picture. He was not a man of many words. “Granddad never talked,” said his grandson John Lee Elliott. This reflected his culture as much as his character. 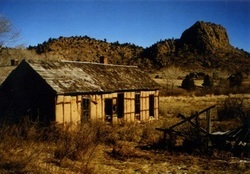 Author Gretel Ehrlich concluded that the solitude surrounding rural westerners makes them quiet. They have feelings, but they lack, according to Ehrlich, an adequate vocabulary for expressing them. Their language is painfully compressed. “Sentence structure is shortened to the skin and bones of a thought.” This applied to John Elliott. To men of his stamp, talk about emotion signified weakness. The mawkishness of Country and Western song arose as a compensation for the emotional reserve of everyday life in the rural West. Otherwise, his words were few, which is perhaps what made him good at turning a phrase. He was known for that. The words that have passed down in his name are witty and memorable. Usually, it is in fact the remarkable phrase a man utters that becomes part of oral tradition. For Elliott there are quite a few. And yet there is no certainty that the words attributed to him are exactly the ones he spoke. That is the way with oral traditions. One of his sayings, for example, we collected in three versions. Elliott was giving instructions on putting fuel in his gas-guzzling truck, and said, “Well boys, be sure and shut it off when you pull it up to the filling station or you’ll never get it full.” Another version: “You never want to leave the motor running or you’ll never get it filled with gas.” The wording is a little different, but the gist is the same. The existence of several versions suggests that Elliott said something to that effect. He spoke an English rarely heard today, terse, pungent, and careless of school grammar. We can be sure of that because his speech was recorded in an interview he gave in 1956, when he was seventy-seven. The voice is deep and a little hollow, as is often so with old men. At one point he tells about the sons of a neighbor who took over their father’s ranch. “They went broke on it. They couldn’t run it the way the old man done. Gonna show us all how to run cattle. And they went broke.” The short rhythmic sentences and the pithy judgment are characteristic. The first major explorer of the interior West to see Rabbit Creek country was John Charles Fremont, who passed near the mouth of the stream in 1843. Fremont was leading his second expedition into the Rocky Mountains to find, as he put it, a new “road of emigration” to the west coast—a quicker, more southerly route for the Oregon Trail, which was already in use. The goal of his sponsors was to open the West to white settlement. Fremont’s second expedition did in fact play a key role in extending westwards the American empire. The vivid reports of his explorations (written by him and Jessie Fremont) inspired thousands to emigrate, and the maps made by Charles Preuss, his German cartographer, were used as itineraries by the Forty-Niners and emigrants on the Oregon Trail in the 1850s and 1860s. In July 1843, Fremont’s company entered the eastern foothills of the Rockies, in what is present-day Larimer County, Colorado. At that time this was uncharted country—“an uncertain and dangerous region” Fremont called it. He noted that few trappers remained in the area; he heard some had been killed by Indians. No one was able to tell him of an easy passage over the mountains to the west coast. Christopher “Kit” Carson served as guide to the company, but he did not know, and Fremont evidently did not ask the local Indians. This “high rolling” terrain and the “Black Hills” to the west of the company were in fact the upper Rabbit Creek country, seen at a distance of four miles. “The Black Hills” were so called because they were crowned with groves of dark-looking Ponderosa pine, which sharply contrasted with the tans of the predominant grass and shrublands. Middle Rabbit Creek flows through this higher terrain, and then joins with the North and South Rabbit to form the main stream which drops down into the park lands of the lower Livermore region. Fremont’s brief description of the Livermore valley records some of its salient features. The heavy rains that plagued the expedition were part of the short monsoon season that typically occurs at the end of July in this part of the country. Herds of mule deer still pass through the brushlands. The southernmost canyon of the North Poudre, though now partly filled by a reservoir, is still unspoiled and dramatic, and the river is no easier to ford. I know this from personal experience. As of this writing, there are plans to expand the reservoir and flood most of Fremont’s wild and beautiful chasm. I wonder, would he have approved this latest step in the conquest of the West? Today, the watershed of the North Poudre is still largely rural, yet since Fremont’s expedition the landscape has been reshaped by human hands and machinery. For that reason it is poignant to think back and imagine the time, only a hundred and sixty-four years ago, when Fremont passed through. Then there were no dams in the Livermore country. There were no rural subdivisions, no houses of any sort, no barns, no ranches. There were no fences, irrigation ditches, power lines, cell phone towers, paved roads or even improved dirt roads. Exotic plants like tumbleweed, wooly mullein, leafy spurge, cheatgrass and crested wheat grass had not yet invaded the native soil. Wolves, grizzlies, bison, and elk had not yet been hunted into local extinction. There were no Euro-American settlers when Fremont passed through, yet even at that time the landscape was not untouched by human beings. By the 1840s, seasonal trappers had eliminated the beaver from the streams. Much earlier than these latecomers, Paleo Indians and their successors used the Livermore lands as hunting grounds—for at least ten thousand years. Native Americans set fires to renew the grasses and to aid in hunting, and those fires altered the landscape and patterns of vegetation. They made tepee rings of rocks—to hold down the hides at the base of a tent, and they dug cooking pits in the soil. They named the features of the land. “Rabbit Creek” may have been a Ute name that was later translated by trappers. The Mountain Ute name for the North Poudre was the “Little Otter”—evidence that this rare mammal thrived in the valley, though it is no longer found there today. Otter figured in Ute tales: he had more hair than any other creature and so wanted winter to last nine months of the year, but Hawk held out for a shorter cold season, and he more or less prevailed. After Fremont’s passage, the Livermore region, and within it the Rabbit Creek district, remained Ute territory for twenty years or more. In 1860, Colorado became a Territory and the decade that followed witnessed the first wave of white settlement in the Livermore valley. Fremont thought it would be easy enough to build a road up the lower North Poudre Canyon. Did he have an inkling that this land would soon be settled, and that thirty-three years after his visit it would be one of the main stockgrowing regions in the new State of Colorado? John and Ida Elliott bought their ranch on Middle Rabbit Creek in 1910, two-thirds of a century after Fremont passed through Livermore country. They were not, however, the first Euro-Americans in the little valley, which, as we know, was first settled by the Hardens in the late 1860s. The Elliotts, like Fremont, were susceptible to the beauty of the landscape, but like most of their contemporaries, they saw the land chiefly in economic terms, as a place for raising livestock. Place is of course relative to scale and point of view. The Middle Rabbit valley changes aspect with the kind of lens used to examine it. The electronic eye of a satellite gives us a different place than does the eye of a stockman looking at pasture grasses. A different place meets the eye of a western harvester ant living in a populous mound near the creek. I catch sight of that ant pushing a bit of granite up the slope of its hill. Another ant goes down a hole and enters a sandy subterranean region teeming with insects, grass roots, fungi, and trillions of bacteria. There it might encounter a springtail or a noodle-like nematode, or it might fasten onto a lost Indian bead. The terrain of the Middle Rabbit valley can be seen through many kinds of human eyes, those of a walker, hunter, botanist, poet, escaped convict, or lover. Who else might be looking, listening, touching? An eagle, perched on top of “Symbol Rock” north of the creek, catches a glimpse of cottontail hopping through brush. The rabbit, with its own view of things, sniffs at an odd-looking stone—a flake of quartzite.